Sunrise is my favorite time, especially those few precious moments just before and after the sun peeks over the horizon, creating "magic light" that bends rays of brilliance in idyllic sprays of tones and colors. On this morning, from the flanks of Mount Rainier, those too flickering moments came more than an hour after we had left our base, Camp Muir. We'd been roused from our uneasy slumber inside the cramped cabin, where the smell of damp clothes, discarded food and standing water mixed with the incoming scent of the overused outdoor solar composting toilet. We had dressed, grabbed a quick snack and rechecked our daypacks before stepping outside into the darkness, where we switched on our headlamps, strapped on our crampons, and tied into our four-member rope team. Our group, like others ahead and behind us, weaved our way up Rainier's flanks. It's a trip that three of us had done before, from this and other directions. But no matter how often it's done, climbing Rainier is always a surreal experience, especially as the quivering darkness yields to morning's light. Stars as bright as bullets peppered the night sky with light while ahead and behind us, tiny peeps of lights from other climbers headlamps created a sensation of swarms of slowly plodding lightning bugs. on the flanks of Mt. Rainier. Climbers travel in the dark and shadows before dawn to gain elevation and distance before the ethereal rays of first light settle into the fixed brilliance of sunshine. It's not because climbers enjoy the prenatal dark, but because of practical reasons: the relative coolness; the reduced risk of avalanches or rock falls; and the secure feeling when ice axes and crampons bite into firm snow. Someday I'll forego the summit attempt and focus instead on those moments of the favored "magic light" with a tripod-mounted camera. Not today. After only a few quick shots, while my rope-mates fidgeted like trout nibbling a worm-wrapped hook, we were back in the march. One more time we were hoping to reach Rainier's 14,411-foot summit, and there was no time to lose. We had started our climb a day earlier from the upper parking lot near the Paradise Visitor Center, an elevation of 5,240 feet. The trail quickly leaves behind the summer swarm of Park visitors, winding to Pan Point, at an elevation of 6,900 feet, and on to Pebble Creek before continuing up the Muir Snowfield to Camp Muir. 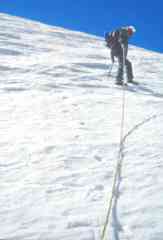 The climbing season normally runs from May to September. Permits are required. Up to 110 people can be permitted nightly at Camp Muir, a semi-level area at a lofty elevation of 10,100 feet. The public shelter holds up to 25 people and has an emergency radio. There are also adjacent buildings which are used by climbers making treks with Rainier Mountaineering, Inc., a long-established guide service. 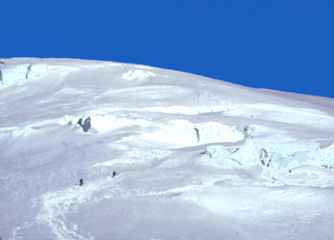 We had passed several guided groups on the struggle to Camp Muir, along the most traveled Rainier route. 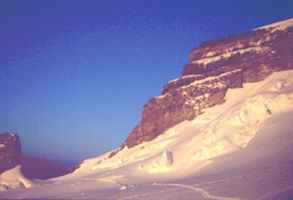 Other years we had climbed the less used Emmons Winthrop Glacier route from Camp Schurman and, another time, up the Kautz Glacier. 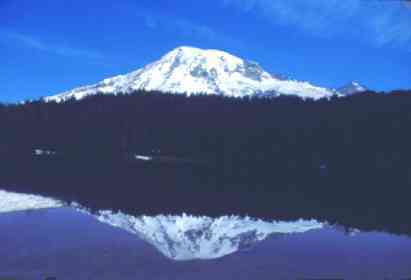 Mount Rainier is a mountain that "the real thing." On this morning, from Camp Muir we had crossed the Cowlitz Glacier to Cathedral Gap, where we continued along the scree ridge to the Ingraham Glacier and Ingraham Flats. Its at an elevation of 11,100 feet, and its the site of another climbing camp limited to 35 people. Barrels for depositing "blue bags" are also located at Ingraham Flats. Blue bags contain two plastic bags, one clear and one blue. They're used to remove human waste from the upper mountain. en route toward Rainier's lofty summit. As morning light colored the eastern sky, we moved westerly toward the Ingraham Ice-fall, following a route that moves like a needle and threads around crevasses and icefalls. On a many-year-ago climb, we curled up, down and around huge blocks that only weeks earlier had loosened and buried a climbing party taking an ill-advised break. As park rangers advised, we moved swiftly and purposely. We peeled layers of clothing as the summer sun heated the slopes. We passed people who had been unhooked from their rope team and left behind while their teammates surged forward. We passed teams of tired climbers debating whether they should continue their summit quest. And we passed teams of climbers with downcast eyes discouraged by the relentless, steep slopes on the Emmons Glacier. Celebration at Summit Crater Steady snow the previous two weeks had guarded Rainier's peak, erasing tracks of previous climbing parties. But we persevered. 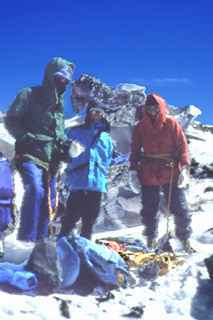 When we reached the summit crater at 14,150 feet, two of our group buried themselves in the snow. 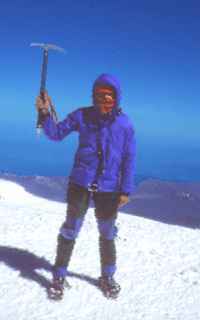 It's not uncommon for climbers who have previously reached Rainier's summit to call the crater good enough. Ed and I decided to continue on to the true summit. It took nearly an hour for us to make the round-trip, our walk slowed by accumulations of ankle deep snow. We took celebratory photos and gazed at the sweeping panorama: Seattle, Puget Sound, and the Olympic Mountains to the west; the peaks of Adams, Hood and St. Helens to the south; Glacier Peak, Mt. Baker and the North Cascades to the north; and the sloping plains and prairies of Eastern Washington. Made it! On top of Rainier. Softened snow made our descent speedy and easy. Still roped together, we took heavy footsteps. We relaxed but remained cautious. 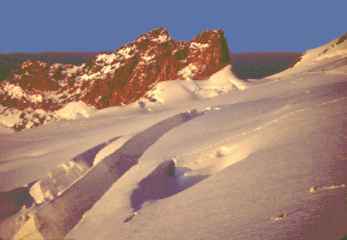 Afternoon heat weakens snow bridges and intensifies the rock-fall hazard. Nearing Ingraham Flats, we passed climbing groups practicing in crevasses or setting up camps. Looking back, Rainier is just as beautiful as up close At Camp Muir we reclaimed our backpacks and debated spending another night or, in the rising afternoon heat, slushing down the Muir Snowfield and back to Paradise. The vote tipped to hiking out after gentle whiffs reminded of us the camp's sour smells. We descended to Paradise and spent the night at a park campground in the pines. Climbers might be accused of not making much sense, but we had enough scents to know when to leave. As we drove off the mountain, we looked back knowing that this would not be the last time we would go for the summit. 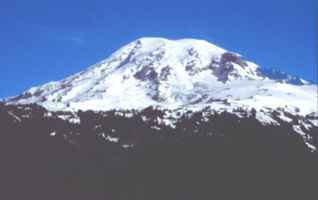 Click here for details to plan your own trip to climb Mount Rainier.